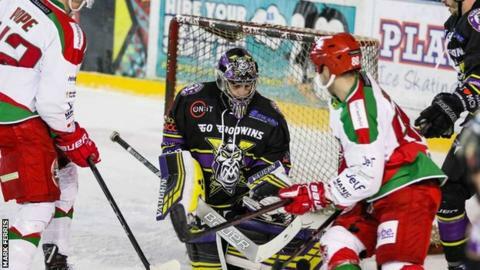 Cardiff Devils moved closer to retaining their Elite League title with an emphatic win over Manchester Storm. Storm's surprise victory over Belfast on Friday gave Devils a chance to move six points clear and they took it. Layne Ulmer opened the scoring before Gleason Fournier doubled their lead. Charles Linglet and Stephen Dixon both got on the scoresheet to make it 4-0. The Devils visit Dundee on Sunday with a chance to win the title if they win. The Welsh side would need Belfast to take no points from their home game with Sheffield Steelers.